Originally inspired by a leadership course which required CMNGD (COMMONGOOD) cofounder, Dave, to spend 1 day homeless and beg for $15, this experience forever changed how he and Hannah viewed poverty & homelessness. Then when Dave and Hannah went through the Calgary flood in 2013, they received an outpouring of support to help them rebuild. They committed to giving back to the community even more because every day there are thousands of Calgarians in need of housing & additional support of their own. I’ve taken some upgrading, attended workshops, I am ready to work but no one will take a chance on me. — explained Denis, living at the local homeless shelter. Dave & Hannah's passion and history in social justice issues led them to volunteering at the Calgary Drop-In & Rehab Centre. What they kept hearing from the people living there was similar. Once you are living in a homeless shelter, the barriers to get out of the cycle are impossible to solve by yourself. After speaking with multiple agencies, they confirmed that employment for people faced with homelessness or transitioning is a barrier. Employers are not equip or willing to take a chance, and without stable employment, you can’t find or keep your home, creating a loop that keeps people stuck in our systems and in poverty. It's why the housing first initiative is so important and for those that can work, creating an employment model to support them as they transition into housing is also important. 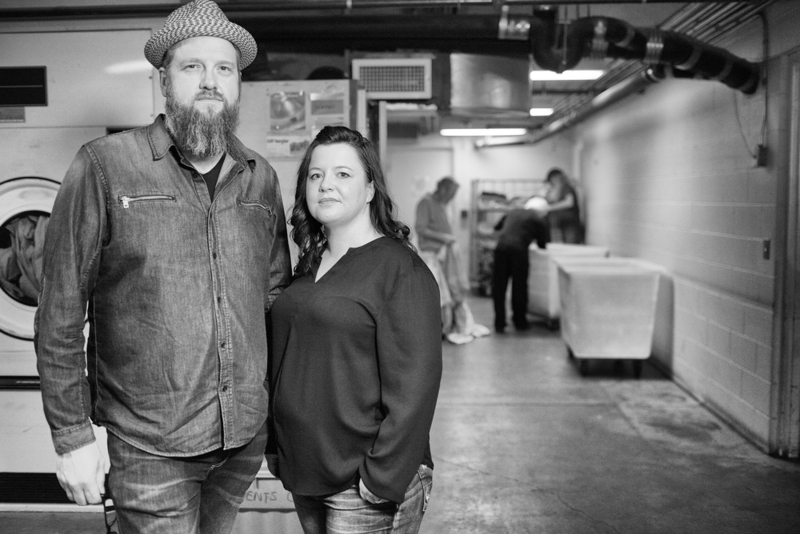 There was a gap, and after years of volunteering and research, speaking to social service agencies and finding a business model to support it, Dave & Hannah decided to use their entrepreneurial background, deep love for community & blend it with their passion for social justice issues to address employment barriers for people who experience poverty and homelessness. CMNGD (COMMONGOOD) launched in June 2016, and full operations by September 2016 with the support of a variety of community partners like ATB Financial, the Calgary Drop In & Rehab Centre, FreshStart Recovery, The Alex, Momentum and a variety of businesses and private investors in Calgary. For the first year, CMNGD (COMMONGOOD) scaled out of the basement of the Calgary Drop-In & Rehab Centre, using their commercial laundry machines in the evening and employing people living at the shelter. In December 2017, CMNGD purchased a commercial laundry plant which increased their capacity and expanded into the health & wellness industries and events, adding even more impact employment hours. The operation is simple: CMNGD picks up and delivers tens of thousands of linens from restaurants, spas, fitness centres & events every week. Then they wash, dry, iron and fold these linens (uniforms, napkins, towels, bed sheets, etc) and deliver them ready for use. This model is a repetitive employment model that allows for easy training and consistency for our barriered employees. The impact lies in the simple but significant undertaking in the employment model; hiring people who are faced with poverty barriers providing on the job training, mentorship and ensuring they are connected to the right social service agencies. And let's not forget about the environmental impact, CMNGD is using compost from local restaurants and turning it into biofuel technology and using solar power to heat their water. This significantly reduces their environmental impact and reduces operational costs. CMNGD customers are locally owned and operated restaurants, spas, fitness centres and events, please support our partners and please refer those businesses to us.